The Rat City All Stars have been putting in the hard work at home and on the road. 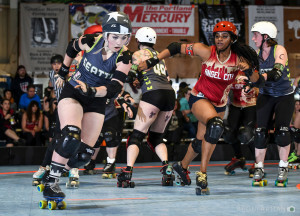 The season started in March as we hosted San Diego’s Starlettes for not one, but two nights of intense derby. Your All Stars took two victories, the second of which was a WFTDA sanctioned bout. This season sees our All Stars hitting the road for plenty of tournament play, including two trips to our neighbor to the south – Oregon. The first road trip took the All Star Team to Eugene for the Big O. Two intense battles were lost to Arch Rival and Texas on Friday and Saturday, then we rounded out the weekend with a victory over Helsinki. Three days of amazing international competition makes for a pretty good way to spend a weekend in our book. Less than a month later and the All Stars were on the move again, this time joined by the Rain of Terror B team for a trip down to Portland for the Hometown Throwdown. 2015’s WFTDA champs and sisters-to-the-south Rose City hosted our own teams along with LA’s Angel City A and B teams. A hard fought game against the reigning WFTDA champs Sunday saw the All Stars fall to the Wheels of Justice 217-111, but Friday night brought the All Star Team its biggest win of the season. The All Stars upset Angel City’s Hollywood Scarlets in an extremely close game that ended in our favor 148-142. Rain of Terror also took a win against Angel City’s Rocket Queens 180-113, after a loss to Rose’s Axels of Annihilation. Capping off the month, the All Stars traveled south once more, accompanied by the Puget Sound Outcasts to St. Louis for some Sibling Rivalry. Rat City took a victory over Atlanta, and lost hard-fought games against Minnesota RollerGirls All-Stars and Jacksonville’s New Jax City Rollers. Capping off an amazing weekend, our own CeeCee was named MVP Blocker. It’s been a busy summer already, and the recent tournament play has pushed our ranking up two positions into 11th! The hard work continues as All Stars keep training with an eye on WFTDA playoffs in September.